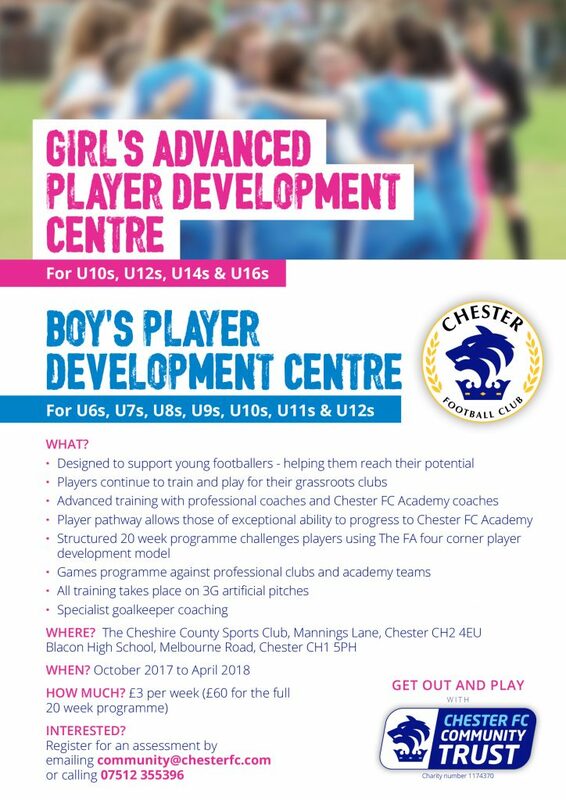 The Chester FC Community Trust are committed to developing the women’s game and have exciting plans for the future, with their Advanced Player Development Centre central to realising those ambitions. The Development Centre caters forgirls aged 10-16. Helping young footballers to reach their potential, the Chester FC Player Development Centres offer advanced training with professional coaches in a positive environment. Players selected for the Girls APDC continue to train and play for their grassroots club, and will take part in a 20 week programme based on the The FA four corner player development model. The centres are based on 3G artificial pitches and feature a games progamme of fixtures and festivals against professional clubs and academy teams. Designed to bridge the gap between grassroots football and elite football, the Girls APDC provides a pathway to the Chester FC Womens side or FA Regional Talent Club programme for players of exceptional ability. Prospective players can register for an assessment or find out further information via ben.richards@chesterfc.com or by telephone: 07791 639512.